Modern Musclehead Ep14: With Borge Fagerli On Macros, Metabolism, Myo-Reps, and Much More! Borge Fagerli joins Physique Coaches Scott Tousignant and Bryan Krahn to discus a variety of training, nutrition, and lifestyle practices to carve out an aesthetic physique. I guarantee you are going to walk away with a list of actionable strategies that you can immediately begin to apply towards building rock solid muscle with chiseled details. *** Tying together the science, anecdotes, theory and practice of it all… seeing the trends and where you could place things into proper context when it comes to setting and adjusting your macronutrient intake. *** Insights into ketogenic diets. *** Should you increase your activity or decrease your calories first when creating a deficit? *** When and how to include cardio. *** Earning training frequency volume. *** What is the ideal rep range for each body part? *** People tend to gravitate more towards the type of training that you are more suited to. Be intuitive. *** The benefit of being ‘in-tune’ with your body and how it responds to training. *** Carb backloading and biorhythm based diets. *** Using circadian rhythm to determine when you should workout. *** Downsides of Intermittent Fasting. *** What to eat prior to an early morning workout. Should you train fasted, have a shake, or a meal? *** Auto-regulation in your training. ‘Bring it’ when you’ve got it and dial it back when you don’t. Enjoy the episode… and as always, we appreciate your feedback. If you have any topics you’d like us to cover in future episodes, feel free to send us an email or post them in the comment section below. 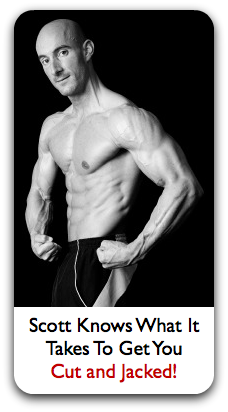 Scott Tousignant, BHK is a Physique Coach and Elite Natural Bodybuilder with the UFE. Scott specializes in helping regular men and women sculpt their body into a chiseled work of art. Viewing training as an art form and your body as a sculpture is a simple shift in mindset that brings out the beauty in your ongoing body transformation. …It’s an opportunity for self growth and self discovery that will impact every area of your life.